According to 6Wresearch, Middle-East video surveillance market is projected to touch $1.8 billion by 2021. In Middle-East video surveillance market, IP video surveillance segment recorded aggressive growth over analog video surveillance segment. Growing construction market, rising IT infrastructure, increasing security spending coupled with growing security concerns have driven the video surveillance market in Middle-East. 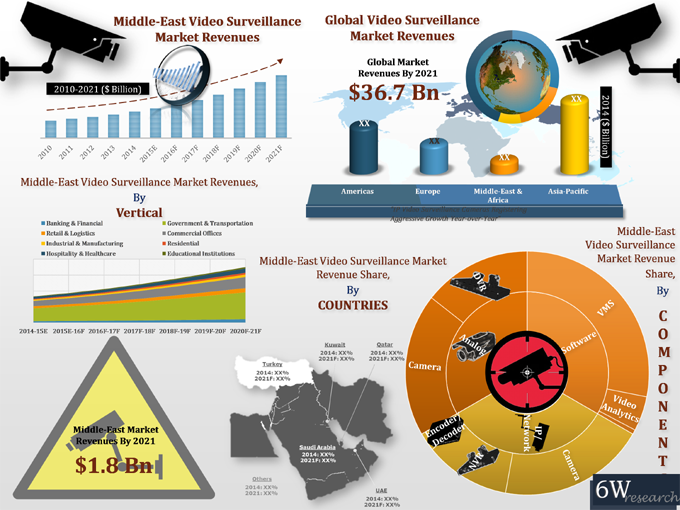 Amongst all the verticals, government & transportation sector acquired highest market revenues in the over video surveillance market in Middle-East. Over the next six years, verticals primarily, government & transportation and commercial offices are anticipated to grow with relatively higher CAGR from 2015 to 2021. Various verticals including government & transportation witnessed major shift from analog to IP video surveillance and would continue to growth over the next six years. The report thoroughly covers video surveillance market by types, components, verticals and countries. The report provides an unbiased and detailed analysis of the on-going trends, opportunities/ high growth areas, market drivers which would help the stakeholders to decide and align their market strategies according to the current and future market dynamics. 15.4 Bosch Security Systems, Inc.
15.6 Hangzhou Hikvision Digital Technology Co. Ltd.
15.12 Samsung Techwin Co. Ltd.
Middle-East is one of the fastest growing regions for electronic security systems market, wherein video surveillance segment generated majority of the market demand. Middle-East video surveillance market is primarily driven on account of growing constructions market, increased foreign investments, along with rising security concerns, predominantly terrorist threats, security spending and international events. Amongst Middle-Eastern countries, Turkey held majority of the market share, followed by Saudi Arabia, UAE and others. Middle-East video surveillance market is exhibiting growing demand for IP/ Network video surveillance systems, where analog video surveillance systems being on the declining phase. Middle-East significantly witnessing emerging demand for IP video surveillance systems in government & transportation and commercial offices vertical. Additionally, the market is witnessing growing trend on video analytics software and Pan-Tilt-Zoom (PTZ) IP cameras. In the forecast period, upcoming events such as World Expo 2020 and Football World Cup 2022, would create huge demand for video surveillance systems.